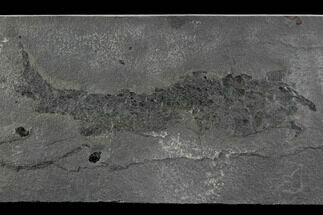 This is a really special, museum quality fossil. 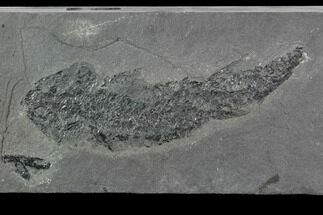 It is a 9.6" long, Tristichopterus alatus from the Early Devonian, Old Red Sandstone of Scotland. 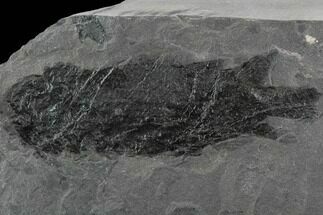 Closely related to the ancient lobe-finned fishes Eusthenopteron, it is considered a transitional fossil between fish and early tetrapods! It was portrayed in early reconstructions as crawling from the water on small forelimbs. That is currently not believe to be the case, but it was very close to the line from which tetrapods arose. 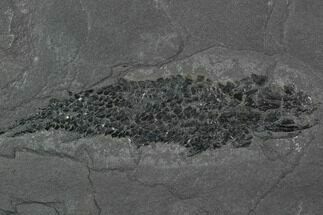 It shares several characteristics with tetrapods such as the bones corresponding to forelimbs and some of the skull elements. 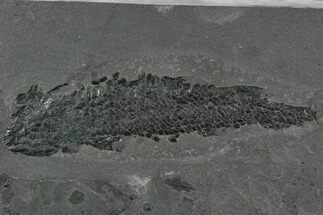 This museum quality specimen is 9.6" in length and beautifully preserved on a thick slab of limestone. It was collected from Rousay on the Orkney Isles of Scotland. 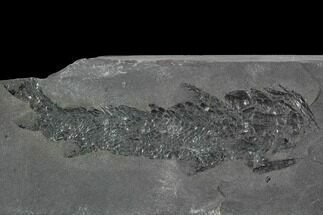 There are several repaired cracks in the rock but the fossil has not been restored.